Ward Sparrow (left), Executive Director of Income and Finance at Samaritans, celebrates �100,000 raised with Robin Litten, Chief Financial Officer at Leeds Building Society. Picture by Phillip Job. Local customers have helped a building society raise £100,000 for charity. Staff at Leeds Building Society held a number of fundraising initiatives in aid of its charity partner Samaritans. The society is aiming to raise £250,000 by March 2020, with Whitley Bay among the branches taking part in the fundraising. Fundraising activities so far include the Great North Run, 39 raffles, 16 book sales, a cycle ride, the Rough Runner obstacle course, skydives and more. The activities will support the purchase and installation of new equipment, including laptops, headsets and phones across all 201 Samaritans branches. Robin Litten, chief financial officer at Leeds Building Society, raised more than £2,000 by cycling the 2018 Etape Du Tour, which followed the 158km route of the 10th stage of the Tour de France and its four categorised climbs totalling 4,017m. 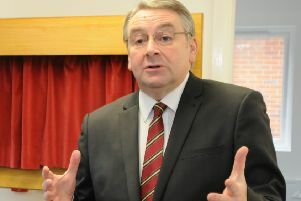 He said: “The partnership we have developed with Samaritans has been fantastic. Both organisations have a philosophy of people helping people and we knew our colleagues across the country would welcome this partnership. “The breadth of fundraising activities colleagues have taken part in has been incredible. We’ve already reached the key milestone of £100,000 in less than a year and we’re looking forward to what the future holds. Ward Sparrow, executive director of income and finance at Samaritans, said: “We’ve been overwhelmed with the support and enthusiasm from everyone at Leeds Building Society to raise money for Samaritans. “What they have achieved in just six months through so many fun and creative fundraising activities is brilliant. “The money raised will make huge improvements to branch technology, enabling volunteers to move much quicker between responses and essentially ensure we can support as many people as we can.